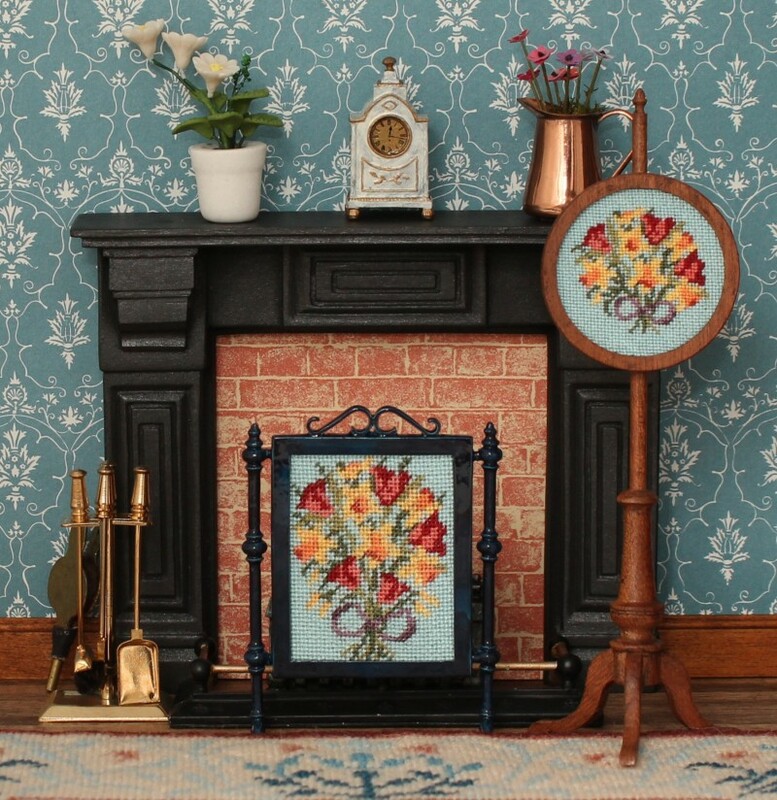 AIM member Janet Granger has recently launched new little pole screen and fire screen needlepoint kits for doll's houses. She tells us that the sweet, little kits are great fun to make and will give you hours of stitching pleasure during the winter evenings. The pole screens are to be stitched on 40 count silk gauze and the fire screens on 32 count silk gauze. These co-ordinating kits are all designed around the theme of 'the four seasons'. 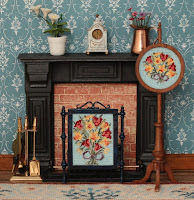 Janet explained that she already had the second fire screen from the left in this line-up below in her range of over 260 kits and that inspired her to design the rest, as she thought that the other seasons could all be represented in needlepoint, too. They are all suitable for twelfth scale doll's houses. The pole screen, when finished, is five inches high, and the fire screen is 2 3/4 inches high. The fire screen kit contains a white metal kit in three pieces to make the frame, and the pole screen kit contains finely-turned mahogany pieces to make the pole screen. Each kit contains a colour block chart to count the design from (the design isn't printed on the fabric), a suitable fine needle, generous amounts of Anchor stranded cotton (floss), a piece of silk gauze and detailed instructions. The fire screen frames are simply glued together with a contact adhesive such as Araldite, and then finished with enamel hobby paint, such as Humbrol (not included in the kit, but the colour used on the model is suggested on the instruction sheet). The pole screens are glued together with wood glue, and then finished with mahogany wax polish - you can purchase a Wood Finishing Kit from Janet's website for this, or you can simply leave the wood in its natural state. Janet explained that both types of kit are very easy to make, but she also provides tutorials on her website about how to put each one together, if you'd like to see that first! The fire screen kits are £20.95 each, and the pole screen kits are £19.95 each and would make great Christmas presents, either for yourself or a friend. Visit www.janetgranger.co.uk to see these kits now! From the left; Spring Flowers, Summer Roses, Autumn Harvest, and Winter Wreath.